Journal of Nanjing Agricultural University, 2019, 42(2): 276-283. 吕子豪, 王春燕, 林同. 黄野螟糖原磷酸化酶基因的时空表达动态及其对温度胁迫的响应[J]. 南京农业大学学报, 2019, 42(2): 276-283. Abstract: [Objectives] This study aims to identify the glycogen phosphorylase(GP) genes and clarify its expression pattern of different stages, different tissues and response to temperature stress, and provide basis for further study on the cold resistance mechanism of Heortia vitessoides. [Methods] The full-length cDNA sequence of GP gene from H.vitessoides was obtained by analyzing the transcriptional library and further veridied by homologous alignment and phylogenetic tree. The expression pattern of different stages, different tissues and response to temperature stress were analyzed by RT-qPCR. [Results] The selected gene was named as HvGP(GenBank No. MG517442). The ORF frame was 2 526 bp and encoded 841 amino acids. Homologous alignment and phylogenetic tree analysis showed that the amino acid sequence of HvGP had the highest homology with Ostrinia furnacalis(95%), and H.vitessoides and O.furnacalis were in the same phylogenetic tree branch. H.vitessoides and Bemisia tabaci had the lowest homology(78%), and were the furthest apart from phylogenetic tree. The RT-qPCR analysis showed that HvGP expression was the highest in the 5th instar larvae. 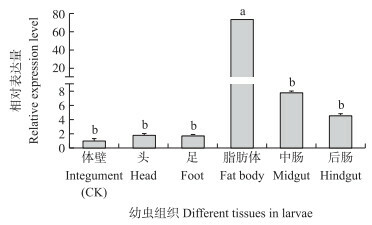 The expression of the fat body in larva was 72.85 times higher than that in epidermis. The adult tissue analysis showed that the expression of HvGP was the highest in the wings and the lowest in the feet. The expression of HvGP at 5, 10, 15 and 20℃ were higher than that of the control group at 25℃, and the expression of HvGP decreased gradually at 30, 35 and 40℃. [Conclusions] According to the expression patterns of HvGP in different developmental stages and tissues, we infer that HvGP might be related to feeding, exercise, tissue differentiation and other life activities. The expression level of HvGP after exposure to different temperature indicated that HvGP could respond to the low temperature signal, and there was a negative correlation between high temperature and HvGP expression. 图 1 黄野螟GP基因核苷酸序列及其编码的氨基酸序列 Fig. 1 Nucleotide and deduced amino acid sequences of GP gene from Heortia vitessoides AMP结合位点以方括号标注; 磷酸吡哆醛结合位点以阴影覆盖; 糖原储存位点以打点标注; 磷酸化位点分别以圆形(Thr)、方形(Ser)、倒三角形(Tyr)标注; 低密度复杂区以加粗下划线标注; 起始密码子和终止密码子TAG分别以细横线与星号标注。AMP binding site are marked with brackets; pyridoxal phosphate cofactor binding site are marked with shadow; glycogen storage site are marked with dot; threonine phosphorylation sites, serine phosphorylation sites, tyrosine phosphorylation sites are marked with round, square and triangles, respectively; low-complexity regions are marked with rough underline; the initiation codon and the termination codon are marked with fine stripes and asterisks, respectively. 图 3 预测的HvGP三级结构 Fig. 3 Three-dimensional structure of HvGP 图中彩虹条表示从N端到C端的氨基酸; 1、2、3、4分别表示α-螺旋、无规则卷曲、延伸链和β-转角。 The rainbow bar represents the amino acid from N-terminal to C-terminal; 1, 2, 3, 4 represent α-helix, random coil, extended strand and β-turn, respectively. 图 4 基于GP氨基酸序列构建的系统发育树(NJ法) Fig. 4 Phylogenetic relationships based on GP amino acids from 14 species of insect O.furnacalis:亚洲玉米螟(AFO54708.2);H.armigera:棉铃虫(XP_021190210.1);B.mori:家蚕(NP_001116811.1);N.lugens:褐飞虱(XP_022190596.1);D.melanogaster:黑腹果蝇(NP_722762.1);A.cerana:中华蜜蜂(XP_016904748.1);B.dorsalis:桔小实蝇(XP_011197467.1);B.tabaci:烟粉虱(XP_018895868.1);L.decemlineata:马铃薯甲虫(ARI45060.1);T.castaneum:赤拟谷盗(XP_968960.1);M.pharaonis:小黄家蚁(XP_012535441.1);A.aegypti:埃及伊蚊(XP_001650265.1);T.pretiosum:短管赤眼蜂(XP_014238995.1). 图 5 HvGP基因在黄野螟各虫态中的表达量 Fig. 5 The expression level of HvGP in developmental stages of H.vitessoides 数据为“平均数±标准差”, 不同字母代表差异显著(P < 0.05), 下同。Data in the figure are represented as x±SD. Different letters mean significant difference at 0.05 level. The same as below. CK:卵Egg; L1、L2、L3、L4、L5:1~5龄幼虫Larve stage 1-5;P:蛹Pupal; A:成虫Adult. 茅裕婷, 张蒙, 靳秀芳, 等. 土沉香对黄野螟的抗性研究[J]. 华南农业大学学报, 2017, 38(6): 89-96. Mao Y T, Zhang M, Jin X F, et al. Study on resistance of Aquilaria sinensis against Heortia vitessoides[J]. Journal of South China Agricultural University, 2017, 38(6): 89-96 (in Chinese with English abstract). 乔海莉, 陆鹏飞, 陈君, 等. 黄野螟生物学特性及发生规律研究[J]. 应用昆虫学报, 2013, 50(5): 1244-1252. Qiao H L, Lu P F, Chen J, et al. Biological characteristics and occurrence patterns of Heortia vitessoides[J]. 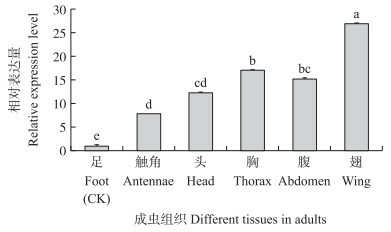 Chinese Journal of Applied Entomology, 2013, 50(5): 1244-1252 (in Chinese with English abstract). 陈豪, 梁革梅, 邹朗云, 等. 昆虫抗寒性的研究进展[J]. 植物保护, 2010, 36(2): 18-24. 陈永杰, 孙绪艮, 张卫光, 等. 桑螟越冬幼虫体内蛋白质、氨基酸、碳水化合物的变化与抗寒性的关系[J]. 蚕业科学, 2005, 31(2): 111-116. 韩瑞东, 孙绪艮, 许永玉, 等. 赤松毛虫越冬幼虫生化物质变化与抗寒性的关系[J]. 生态学报, 2005, 25(6): 1352-1356. Steele J E. Glycogen phosphorylase in insects[J]. Insect Biochemistry, 1982, 12(2): 131-147. 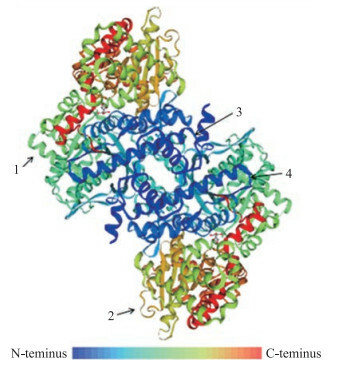 Brostrom C O, Hunkeler F L, Krebs E G. The regulation of skeletal muscle phosphorylase kinase by Ca2+[J]. Journal of Biological Chemistry, 1971, 246(7): 1961-1967. 李毅平, 龚和, 朴镐用. 松针瘿蚊越冬幼虫体内酶活性的时序变化[J]. 昆虫学报, 2000, 43(3): 227-232. Guo J Q. Cloning and expression analysis of glycogen phosphorylase gene in Ostrinia furnacalis(Guenée)(Lepidoptera: Crambidae)[D]. Beijing: Chinese Academy of Agricultural Sciences, 2013(in Chinese with English abstract). 刘流, 贺莉芳, 刘晖, 等. 滞育家蝇幼虫糖的变化[J]. 医学动物防制, 2008, 24(11): 803-804. 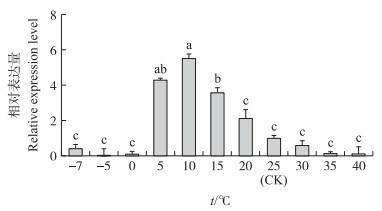 Zhao N. Expression pattern of glycogen phosphorylase gene during development and in response to temperature stress from brine shrimp, Artemia sinica[D]. Dalian: Liaoning Normal University, 2013(in Chinese with English abstract). 易传辉, 陈晓鸣, 史军义, 等. 柑橘凤蝶滞育期间糖类物质和脂肪含量变化[J]. 西南农业学报, 2009, 22(4): 1142-1145. 景晓红, 郝树广, 康乐. 昆虫对低温的适应——抗冻蛋白研究进展[J]. 昆虫学报, 2002, 45(5): 679-683.